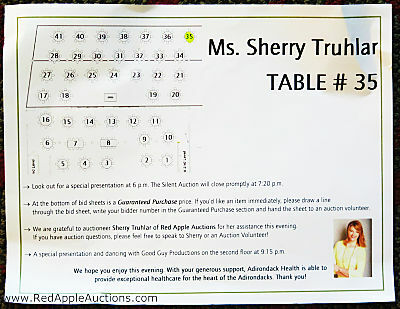 The back of this auction bid card revealed the guest’s name, table assignment, room layout, and other key information. Here’s a clever way to ensure guests keep their auction bid card as they mingle during the silent auction reception. One of my client’s included key information on the back of each paddle. The only item handed to each guest at the registration desk was this bid card. Guests weren’t given any other materials, such as a program and/or auction catalog. Instead, a program was placed on each guest’s chair in the ballroom. It held information on sponsors, the honoree, advertisers, and descriptions of the live auction items. A program was on each chair in the ballroom, eliminating the need to distribute it during registration. I like this bid card style for a few reasons. It’s easy for a guest to carry one item versus several. If this bid card is accidentally left on a cocktail table during the reception, it’s easy for staff to find its owner. Because the name and location of each bidder is on the paddle, staff can deliver the auction paddle directly to the guest. 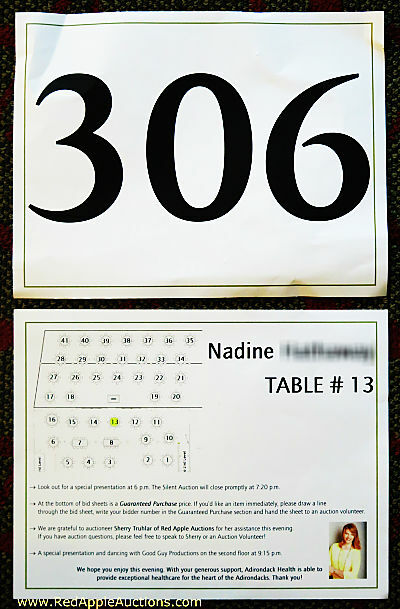 It eliminates the need for larger signage showing the ballroom layout and table assignments. The program and/or auction catalog can be printed days or weeks in advance and these bid cards — which are easy to print (perhaps even print in-house) — can be produced nearer to the gala date, once seating assignments are confirmed. This was the back of my bid card. See how my table assignment was highlighted? It made it easy to find my seating assignment. 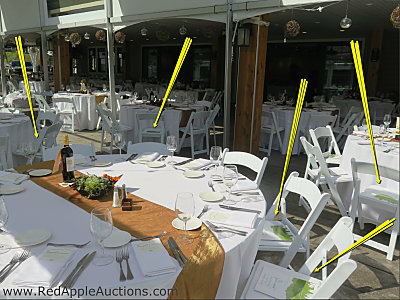 For cocktail-style / walk-around fundraisers, using the bid card to convey table assignments would be unnecessary because guests don’t have assigned seats. Don’t leave the back of your bid card blank. Here are some suggestions on how to use the real estate on the back of the bid card. My point: The back of the auction bid card is valuable real estate. Consider the best ways to use it for your event.